The axe seems set to fall yet again on the Western Daily Press, the South West morning paper whose staff were reduced to a rump by the last spree of bloodletting in April. Staff at the city’s Northcliffe news centre have been invited to a meeting on Monday, November 1 in the Bristol boardroom. The Western Daily Press has already been reduced to a sister edition of the Plymouth-based Western Morning News. It is unclear that it could survive any further staff cuts. The Bristol production hub produces pages for weekly titles across the South West as well as the three major daily papers. More than 30 jobs were cut by the company across the South West in April 2010, of which 11 were in Bristol. 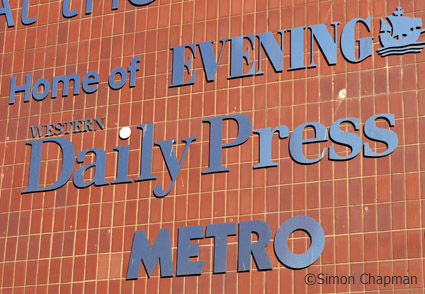 A major restructure further slashed job numbers at the Western Daily Press with several newsdesk jobs moved to Plymouth, while sub-editing posts were moved from Plymouth to Bristol. The company has a history of savage editorial job cuts as circulations at the two main Bristol titles, the Western Daily Press and the Bristol Evening Post, fall by up to 10 per cent a year. In March last year the company shed almost a third of its 154 staff. It followed an cull of 36 staff in 2006.